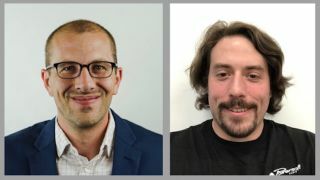 Andrew Pernetti (left) and James Putland Powersoft has announced two appointments as it seeks continued growth in the North American market. The company has named Andrew Pernetti Eastern sales manager and James Putland office manager. Both new employees will report directly to Luca Giorgi, general manager, North America, Powersoft. The announcement comes after Powersoft recently announced its new U.S. headquarters location in Kearny, NJ. The two new appointments aim to bolster Powersoft's North American sales operation while increasing its operational efficiency and customer service capacity. Pernetti comes to Powersoft from Audio-Technica, where he served as sales manager, Professional Markets for seven years. James Putland joins from Pine Bush School District, where he was technical services manager. Prior to his position at Pine Bush School District, Putland held several technical support roles including support lead at Apple, where he served for five years. "Powersoft's recent appointments reflect the company's continued commitment to growing and serving its customer base in the North American region," Giorgi said. "Both Andrew and James bring unique strengths to our team as we look to increase revenue opportunities and operational efficiencies in the U.S. and Canada." As Eastern sales manager, Pernetti will be responsible for Eastern Canada and the United States, interfacing with Powersoft's customers, including dealers, integrators, distributors, and end users. His sales experience includes managing sales representatives across the U.S. and generating sales leads across a diverse range of pro audio channels including MI, pro audio, retail, installed sound, and broadcast. During his seven years at Audio-Technica, Pernetti implemented programs and incentives within his assigned sales territories, helping achieve growth and sales targets. Putland, who will be based out of Powersoft's new Kearny headquarters, brings more than a decade of technical support and office management experience to his new role. While at Apple, he served in various capacities including specialist, expert, and most recently support lead where he was involved in designing and launching educational programs for both new and existing technologies. "In my new role as office manager and as a member of the OEM team, I have touch points with our entire ecosystem, which includes manufacturers, customers, distributors, and reps, and of course, other Powersoft employees around the world," Putland said. "My initial focus will be on helping us achieve increased operational efficiency in North America, while ensuring we have an uninterruptible supply chain. We have tremendous support from the home office in Italy to help us achieve our objectives, and I couldn't be happier or more optimistic."